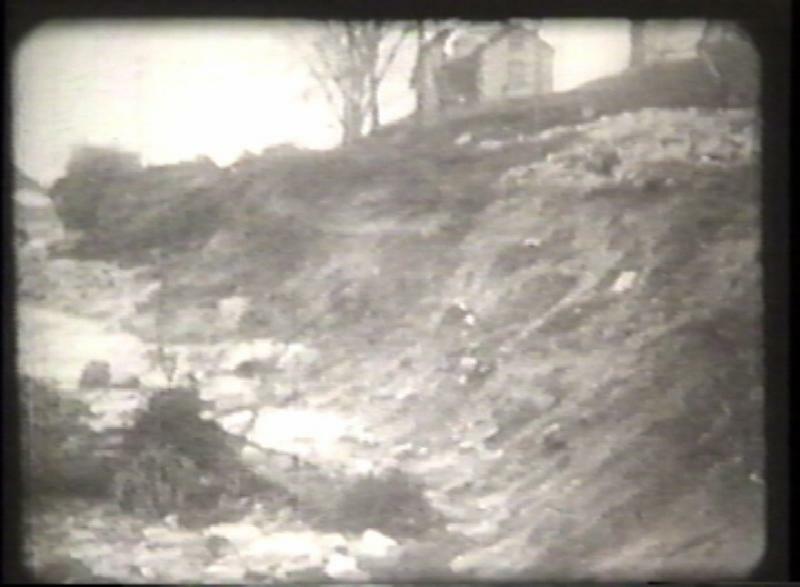 This image is a screenshot from a movie made using actual footage from the 1927 flood: This image is from a clip of the 1927 Flood Movie that begins with the caption "The cut at Proctor after the flood." This image shows the Rutland Railroad cut after the flood waters had subsided. Looking up the cut from the bottom there is much debris visible including some larger rocks in the foreground as well as tangled roots and sticks. Note the steep slope of the cut and the unstable looking soil. It is clear from this image that massive flows of water moved through there during the high-water. There is a house on the top of the hill on the right, undamaged. Note also that there is little to no water flowing through the cut, as it is intended for railroad use and not for water.